memories worth preserving and memories worth keeping! With the Kaiser Baas DVD Maker, transforming your treasured memories to digital is not only quick but easy and affordable; it also gives your ageing VHS collection a new lease on life! The Kaiser Baas DVD Maker easily converts analog video-cassette (VHS) to sharable, compact digital data. Simply connect your VHS player, camcorder, or other video device through S-Video or Composite-Video direct to your PC or Mac. Use the provided software to capture your video content and audio, then edit and easily burn to DVD or simply save to your PC or Mac. The clever capabilities of the Kaiser Baas DVD Maker also allow you upload your newly edited videos to YouTube, Facebook, My Space etc. 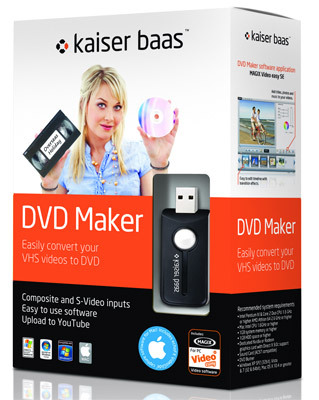 The Kaiser Baas DVD Maker includes MAGIX Video Easy software program for Windows, which allows you to edit your video by adding photos, music, transition and visual effects as well as titles. For Mac users, DVD Maker comes with Video Glide software, which allows you to capture the footage in the required format to edit in iMovie.